Recent news, analysis, and commentary about special operations, national security, and current conflicts from around the world. McChrystal on Suleimani. The former commander of the Joint Special Operations Command (JSOC) Gen (Ret) Stan McChrystal writes about the head of Iran’s elite Quds Force. This organization is “. . . roughly analogous to a combination of the CIA and JSOC.” Read about “Iran’s Deadly Puppet Master”, Foreign Policy, January 23, 2019. GB Foundation Seeks Director. The Green Beret Foundation is looking to fill the position of Executive Director. Here is the job announcement. (PDF). New Scope for SOF Snipers. Special operations snipers are getting a new, upgraded rifle scope. The Sig Sauer TANGO6T 1-6×24 Riflescope is being bought by USSOCOM. (Marine Times, Jan 23, 2019). SOF Jetpacks. The advances in technology are making the dream of jetpacks for individual soldiers more feasible. The age of the jetpack is coming soon and USSOCOM wants to be part of that. (Stars and Stripes, Jan 24, 2019). DFCs for AFSOC Airmen. Six airmen assigned to Air Force Special Operations Command were awarded Distinguished Flying Crosses during a ceremony at Hurlburt Field, Florida on Tuesday, January 22nd. (Military Times, Jan 23, 2019). MACV-SOG Anniversary. Thursday, January 24th was the 55th anniversary of the activation of the Military Assistance Command, Vietnam, Studies and Observations Group (MACV-SOG) in the Republic of Vietnam. Formed in 1964, MACV-SOG functioned as a joint special operations task force (JSOTF) in Southeast Asia. Obituary. CSM (Ret) James Hargraves passed away on Monday, January 21, 2019 at age 81. He had a long career in Special Forces followed by many years working at SF Command at FBNC as a civilian. Read the obituary. Funeral. George “Speedy” Gaspard. A Distinguished Member of the Regiment’s funeral will be held on January 29, 2019 on Fort Myer, VA. He was a Marine in WWII and then later an “Original” member of the 10th SFGA. He later served with MACVSOG (Vietnam), and then as a contractor working overseas in the Middle East. Internment. General (Ret) Sid Shachnow will be interned at the Arlington National Cemetery on February 12, 2019 at Fort Myer, VA. MG (Ret) Shachnow died in September 2018. Shachnow was a long-time member of U.S. Special Forces. Retiring. Major General Chris Haas is retiring after a long and distinguished career in Army Special Forces. Notable assignments included command of 3rd SFGA, commander of CFSOCC-A, and DCOS OPS Resolute Support. Assignment. Colonel Kevin Leahy (SF) has been assigned as deputy commander, Special Operations Command Central, U.S. Central Command, Florida. He has plenty of 5th SFGA time and several tours in Iraq. Operation Cobra. Sean Naylor provides a fascinating account of a mission the CIA ran during the Cuban Missile Crisis in 1962. Read the untold story of how a CIA officer trained a network of agents who found Soviet missiles in Cuba. (Yahoo News, January 23, 2019). Spying Around Corners. A new method of photography now allows objects that are out of sight to be captured with an ordinary digital camera. The computational periscopy technique could be useful for ‘spies’ and ‘SOF’. This could have huge implications (good and bad) for the future of automated, integrated weaponry. Read “Spying around corners just got easier”, Cosmos Magazine, January 24, 2019. Selective Service Commission – Interim Report. The government commission set up to study the selective service system has issued a Interim Report. This report (PDF) explores options to increase service participation among all Americans. The final report is due March 2020. This will include policy recommendations and legislative proposals on the selective service system. See the report by the National Commission on Military, National, and Public Service, January 2019. The Actual Cost of War. The U.S. government has never accurately reported on the real costs of waging war overseas. The estimates of past, current, or future expenditures is highly inaccurate and suspect. A detailed look at this problem is provided by Anthony H. Cordesman in “America’s Military Spending and the Uncertain Costs of Wars: The Need for Transparent Reporting”, Center for Strategic & International Studies, January 23, 2019. Nathan Phillips – Vietnam Vet? Not so much. The media was in a frenzy the past week about the video(s) of the confrontation between high school students in D.C. waiting for a buses and two different, small groups of protesters / marchers. There are different versions of what transpired – but I will leave other news media outlets for explaining that. What is interesting is the fact that the Native American tribal elder at the center of the story is not quite who he was initially portrayed – a U.S. Marine Corps ‘Recon Ranger’ veteran of the Vietnam war. The Marines said in a statement that Nathan, now aged 64 (so do the math), spent four years in the Marine Corps Reserve and left in 1976 with the rank of private (E1). He served as a refrigerator technician, went AWOL a few times, and spent some time in the brig. Short History of NATO. A lengthy article provides a history of the establishment of NATO, its activities over the past several decades, and its current ‘reason for being’. Read “NATO – ready for anything?”, NATO Review Magazine, January 24, 2019. Latvia and Its APCs. Two bidders for the contract to supply Latvia’s military with four-wheel-drive armored vehicles are contesting the purchase of GTP 4×4 APCs from Finland’s Sisu Auto. Read “Latvia halts $206 million armored vehicle contract amid controversy”, Defense News, January 22, 2019. Germany and the Baltic Sea. The German navy is stepping up its activities related to maritime operations. Read “German navy returns to treating the Baltic Sea as a potential theater of war”, Defense News, January 23, 2019. Russia, Serbia, and the EU. There are a couple of countries in Europe with a cozy relationship with Russia (Serbia, Hungary, etc.). Russian President Putin was warmly received during an official state visit to Serbia. Read more in “Russia Flexes Influence in Serbia”, The Cipher Brief, January 24, 2019. Syria – Assad Firmly in Place. Kamal Alam explains how and why Syrian President Bashar al-Assad managed to stay in power in “Kissinger’s Prophecy Fulfilled in Syria”, War on the Rocks, January 23, 2019. Egypt – Still Busy in the Sinai. Egyptian security forces are continuing their operations against militants. A recent battle killed 59 militants. Read “Egypt says dozens of militants killed in Sinai peninsular”, Reuters, January 22, 2019. Mali’s Jihadist and “Shadow Politics”. In 2012 al-Qaeda in the Islamic Maghreb (AQIM) and its allies took control of much of Mali’s northern territory. The territorial holdings of the proto-state was short lived after French intervention. However, AQIM has not gone away. The jihadist group is experimenting in building a shadow state and building political coalitions. Alex Thurston, a professor of political science and comparative religion at Miami University in Ohio, provides his insight in “Timbuktu: A Laboratory for Jihadists Experimenting With Politics”, War on the Rocks, January 23, 2019. Russian PSCs in Sudan. The Russian Foreign Ministry says private Russian companies are training the army in Sudan. According to the ministry the Russian private security companies are training staff of the military and law enforcement agencies . See “Russia Confirms ‘Private Security Companies’ Operating Amid Unrest in Sudan”, Radio Free Europe, January 24, 2019. Venezuela. We usually don’t cover too much of South America but one country has spiced things up lately. U.S. diplomats have been ‘dis-invited’ and the country is a mess economically. Plus a recent mini-coup that failed has folks on edge. If things go further south U.S. diplomats might need to be evacuated. Joseph Trevithick provides his thoughts on how that would go down. (The Warzone, January 23, 2019). Four New War Films for 2019. The Last Full Measure, Greyhound, Midway, and The Aftermath. Watch the trailers for three movies about WWII and one about Vietnam in “4 War Movies Rumored to Release in 2019”, We Are the Mighty, January 14, 2019. SEAL Team Seven Jumps From MC-130J, 1st Combat Camera Squadron, January 19, 2019. (1 min). Bio Movie on Erik Prince. Everyone’s favorite mercenary is getting his own movie. The movie has a working title – “Prince of War”. See “Blackwater Founder Erick Prince Getting Movie Treatment”, Hollywood Reporter, January 23, 2019. 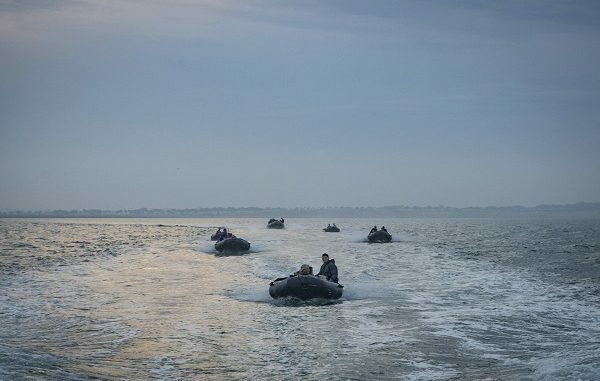 Photo: U.S. SOF pilot small boats during bilateral training between U.S. and Spanish special operations forces and the Arleigh Burke-class guided-missile destroyer USS Porter (DDG 78), in June, 2018, near Naval Station Rota, Spain. SOCEUR photo.